Saewa apologizes to Donghae and tells him that she no longer loves him. Donghae just can’t understand this. I don’t blame him as it is a total shocker for him as he did not see this coming. Maybe if he had considered Saewa’s personal goals and feelings a little more instead of being oblivious to them it wouldn’t have been. I know Donghae is in the wrong, but I still place most of the blame on the ambitious Saewa. I can’t bring myself to like her for whatever reason. Donghae says that just the other day Saewa said she trusted him – what happened all of a sudden? Saewa replies that it isn’t sudden – she had slowly been falling out of love with him for the past 8 months. She thought that if she tried, she could rekindle the love, but it just isn’t there anymore. Wow. Does this girl know how to rub salt into raw wounds or what? Donghae tears up and says that they just can’t end things like that. They dated for six years, how could they break up after only being a part for 8 months. Wow. Only 8 months. He rushes up to her and grabs her arm. He tells her that she must be confused as Saewa knows better than anyone else how in love they were in New York. Saewa says that she loved him and that the love was pure. But in those 6 years, she had a dream and when she got to Korea she realized that it would take a lot of work to realize that dream. So for the past 8 months she has been fighting and clawing her way fiercely to the top. Saewa then says that she can’t do that if Donghae is there. Donghae then tells her all the plans he had made – like winning the world cup and becoming a coach in Korea just to be with her. Saewa coldly brushes him off and says that has nothing to do with her anymore since she doesn’t love him. And here I thought she had some lingering feelings for him, but how can she be so vicious if she really does? Poor Donghae, hearing those words is like a blow every time. Saewa goes to walk away, but Donghae stops her. He says he won’t let her go. 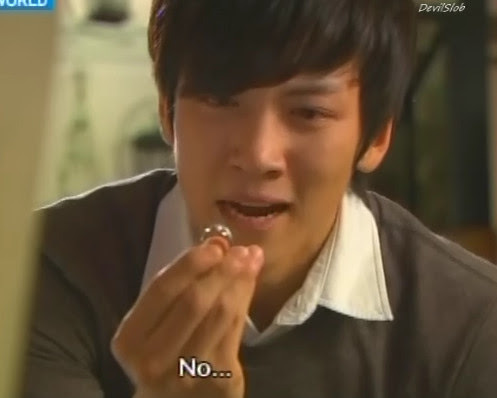 He proposes to her and takes out the ring. He promises he will make her happy forever and that she won’t find a man who will lover her like he does. Saewa just hits the ring to the floor and walks out. Donghae runs after her and tries to stop her once more, but Saewa won’t stop. She gets into her car and speeds off with the heartbroken Donghae running after her. She glares at him in her review mirror and gives it more glass. Donghae eventually stops running and collapses to his knees. My heart aches for him. Though he did go a little crazy when Saewa dropped her bomb, but you can’t really blame him for the temporary insanity, can you? Back at the hotel, Bongi and Anna are putting a puzzle together. Anna is happily thinking about how Saewa will gladly accept the proposal and hug Donghae. Anna tells Bongi that it makes her happy to see her son so happy as well. Poor Bongi, still worried about Saewa and her relationship to Do Jin, can’t quite muster a smile or join in Anna’s happy musings. Donghae goes back into the restaurant and picks up the fallen ring. He asks himself how love can change. He doesn’t believe it can. He then goes and rushes out. Presumably to look for Saewa. The wicked witch is sitting in her car. She at least looks like breaking up with Donghae hurt her. She is keeping back the tears. But she tries to shake it off. She looks at her reflection in the rearview mirror and applies lipstick. And we all know why she is doing that don’t we? Do Jin is in the gym and finally starts on the treadmill after a final look around and still no sign of Saewa. We then hear a voice call out saying they can see Do Jin’s underwear. Do Jin does a quick double take and asks Saewa what that was all about. Saewa climbs on the treadmill next to him and says she got him to look. Do Jin says that she got his attention now – what will she do? Bongi is leaving the hotel. She is on her phone talking to her mother when Do Jin goes whizzing by in his car. Bongi is shocked to see Saewa in the car as well. She immediately wonders what happened with Donghae and the proposal. Saewa hangs up and quickly rushes off. Tae Hoon is studying in his room when Sun Ok comes in with ointment and tells him to pull down his pants. Tae Hoon doesn’t want to, but Sun Ok insists as she doesn’t want to have to pay bigger hospital bills later. Tae Hoon insists on doing it himself, but Sun Ok refuses to let him. She then complains about how she carried him for 10 months to only see the man he’s become today. Tae Hoon tells Sun Ok that Sae Young is sweet and kind – can’t his mother be nicer. Sun Ok replies with she may seem like an angel. 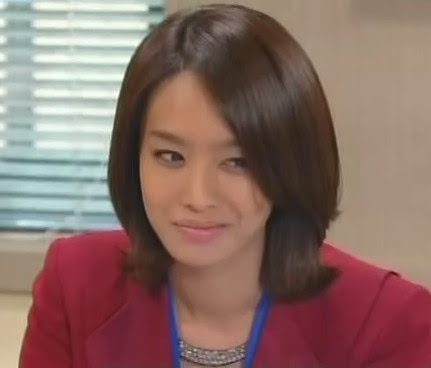 Sun Ok says she hates her son and then slaps the bottom that is sore. Then in comes Kang Jae asking to see him. Uh-oh. Meanwhile Pil Jae and Songi are getting ready for Pil Jae to visit his dead wife’s grave. Songi asks if her mom is pretty and as Pil Jae tells her she is, Sun Ok tells Pil Jae to quickly follow after Kang Jae and Tae Hoon to stop Kang Jae from doing anything reckless. Sae Young comes home and her foot hits against something. She quickly turns on the light and sees a torn off doll’s head. She screams and her mother comes running. Sool Nyeo quickly asks what is wrong and picks up the doll’s head. Sae Young says that she almost lost her twins – how could her mother leave that lying around? Sool Nyeo changes the subject and asks why Sae Young is there when Sae Young said she was going to stay at Tae Hoon’s house. Sae Young says she is only back to apologize because Kang Jae told her to. Poor Sool Nyeo. She starts stuttering and cannot believe her daughter came back to apologize not because she is really sorry but because Tae Hoon’s dad told her to. Sae Young stupidly nods and Sool Nyeo loses her cool and goes to sit on the coach. Sool Nyeo tells her daughter to just get out. Ignoring this, Sae Young asks her mom to talk to Sun Ok for her. Sool Nyeo even more flustered yells that she doesn’t want to see Sae Young anymore and that her youngest needs to get out. Sool Nyeo then says she has worked hard all her life to ensure her two daughters aren’t looked down on. Sool Nyeo then points out the mannequin heads. To Sae Young they may be scary, but Sool Nyeo worked on them night and say just so she could make a living and support the girls without their father. Sool Nyeo did her best to be nice to all her customers and had angry wives storm in and yell at her for flirting. That still happens to this day, but Sool Nyeo didn’t care as she was staying strong for her two daughters. Sae Young at this point hangs her head. She should feel sorry for all the misery she’s caused her mom, right? Although, Sool Nyeo hasn’t really shown her the same affection and attention she’s shown to Saewa, you can still feel her love for her youngest. Sae Young apologizes, I think honestly sorry this time, and the worked up Sool Nyeo asks if she only wants her to beg Sun Ok to be good to Sae Young, or should Sool Nyeo call up all the family and tell them? Sool Nyeo then screams for Sae Young to get out once more. Sae Young keeps apologizing while Sool Nyeo keeps freaking out. Bongi arrives at the restaurant all in a tither, looking for Donghae. But the restaurant is empty. Bongi pulls out her phone and calls Donghae who is just getting out of a cab around Saewa’s apartment. Donghae quickly picks up, thinking it is Saewa, but it is Bongi demanding to know where he is. Meanwhile, Saewa and Do Jin are dancing. Saewa seems uncomfortable in doing this as she doesn’t want to be laughed at. Do Jin tells him to trust him and they begin dancing more. Do Jin spins her away and then pulls her close to him, telling her to trust him in dancing and life. I have to say that this dancing sequence looks too cheesy and fake and more like a dream sequence then actual reality and even the acting seems stiff and not the best here. Afterward, Saewa says the dancing was refreshing and fun. Do Jin says that he learned dancing to get over his sadness and loneliness. Saewa smiles and says she didn’t take him for a guy who would get lonely. Do Jin insists he is lonely, Saewa doesn’t know him at all. He says this with a smile, but then launches into the story about how he was sent off to Switzerland at a young age to study and couldn’t have his parents help when he needed them. He then goes back farther and said he had to learn, eat, and sleep all on his own without his parents because they were always too busy. Poor Do Jin. I honestly hope that Saewa will give him the love her deserves to have. Do Jin then changes the subject and to Saewa. He knows that she went overseas to study when she was only 20 and came back to Korea when she got a job as an announcer. Wasn’t she lonely being all alone in the US for six years? Saewa, surprised, asks how he knows that and Do Jin raises his hand and says that she is his palm. He them smiles and lowers it saying that he looked all the info up online. He then complains that the internet couldn’t tell him about her personal life which is really what he wants to know about. Saewa laughs at this. Meanwhile, the desperate Donghae is outside her apartment building, trying to get in touch of her. Do Jin and Saewa then go to the riverside where Do Jin notices her dour mood and asks what is wrong. Saewa says that she might be sent outside of Seoul to work. This shocks Do Jin and he asks what happened. Saewa tells him about what Donghae did and how that made her look bad in front of the higher ups (of course she doesn’t tell him the whole story about what really happened, i.e. Donghae being her boyfriend and her doing it all behind his back). Saewa then says she is finally starting to open up to Do JIn to only have this happen now. Lying witch. She may be opening herself a bit because he has been really nice to her, but you know its mainly her calculative side in action now trying to secure her job. Saewa then laughs and Do Jin asks why she is smiling. Saewa says it is because she can’t believe she’s telling him how she really feels. She has always kept everything bottled up because of her circumstances, but she is now opening up to Do Jin. This pleases Do Jin and he tells Saewa not to worry as there might be a way to save Saewa. She coyly asks how and he says who knows, a magic genie might save her. Do Jin says if the problem is resolved they can start dating. Blech. Kang Jae and Tae Hoon are in a restaurant and Kang Jae says he has never laid a hand on his son until now. He then tells the story about how he sold off the family land and started his own business. Then Kang Jae’s business failed – he is a horrible father. Tae Hoon doesn’t think that, but Kang Jae interrupts him and says that he beat Tae Hoon because he was so shocked about what happened as Tae Hoon had never caused trouble before. Pil Jae then comes in and asks for a glass and Kang Jae asks how he knew. Pil Jae’s answer is because he is a cop. The three men then drink together. Kang Jae then tells his son to get married after the exams are over. Kang Jae will talk to Sun Ok for Tae Hoon. It may seem like the end of the world, but Tae Hoon needs to take the exams. Kang Jae then tells Tae Hoon to quit talking about Sae Young in front of Sun Ok as she will only get angrier. Tae Hoon agrees and Kang Jae gets up to use the restroom. Once he is gone, Pil Jae asks if Tae Hoon knows what he’s done on top of all this. Pil Jae then says Tae Hoon ruined his wife’s death anniversary. Pil Jae says that today is her anniversary so even Pil Jae’s dead wife is angry at the ruckus Tae Hoon has caused. He apologizes to his uncle and asks if Pil Jae wants him to talk to Sun Ok. Pil Jae tells him not to and brings up again that Tae Hoon’s actions has upset everyone, including Pil Jae’s dead wife. Pil Jae then says after upsetting everyone like that, Tae Hoon had better do well an pass the exams. Pil Jae then says Tae Hoon is lucky his dead wife is a nice person or she would haunt Tae Hoon at night. Tae Hoon sincerely apologizes and Pil Jae says he will kill Tae Hoon if he fails again. Plus, Tae Hoon is the only one who can lift Kang Jae’s spirits once more. Saewa finally arrives home and the desperate Donghae rushes up to her and apologizes. He then says if she tells him what is wrong, he can fix things. Saewa doesn’t think so, but Donghae is bullheaded and forges on. By spending time together they can go back to the way things was before they were separated. Donghae says he will help Saewa achieve her dream. Saewa asks how he can help and what he has to offer. He has no money and an unstable job as an athlete. What will happen if he gets injured? Plus there is Anna whom he has to care for all day. Oh, and he has never lived in Korea before so how can he possibly help her? Ouch. Insult to injury. Donghae says he may not have much to offer now, but that will change. He will become a success to make her happy. He asks her to trust him. Saewa says she can no longer trust his love after what he did to her on television. Wrong choice of words even if they are the truth. Donghae asks if she is still mad about that matter. Donghae takes her hand and says he’ll talk to the producer. Or better yet, he will go on television once more to look for James. He will do whatever it takes to make it right. Saewa tells him that it is too late and tells him to leave before she calls security come and drag him away. She then goes inside. At this time, Bongi arrives. Inside, Sool Nyeo goes into Saewa’s room and immediately starts complaining about Sae Young’s actions – trying to kiss Tae Hoon through the window and calling Sun Ok “mother.” How can Sae Young do that after Sool Nyeo worked so hard to raise the girls. Saewa is not interested. She tells her mother that she is tired. Sool Nyeo then begs Saewa to talk to Sae Young as Saewa is the only one Sae Young will listen to now as Saewa is like a father to her younger sister (and a husband to her mother – that’s just plain creepy). Saewa does not look happy to hear this. Sool Nyeo continues by saying that Saewa knows what Sool Nyeo wants of her. She wants Saewa to marry well and have a family of her own as Saewa is the only one who can make up for the years Sool Nyeo lost. Not a good speech to give your over-driven daughter. After hearing this, Saewa erupts at her mother. She says that she is neither a husband nor a father. Why does she have to have that role when she is just a daughter herself? Saewa then talks about how hard it was for her growing up without a father. Saewa then complains about working hard to earn scholarship money so her mom didn’t have to pay her tuition. Saewa then worked hard studying so Sool Nyeo has no right to come to her and complain. Sool Nyeo chose her difficult life. If Sool Nyeo feels that things are unfair, then it’s not too late to start over. Wowza. Sool Nyeo kind of needed that, though. Saewa needs someone to slap some sense into her now. Yes, being a realist isn’t a bad thing. But being that conniving and driven can destroy your life and the ones around you as well. Sool Nyeo doesn’t know what to say as her eldest storms out on her. At the Kim household, Hye Sook gets up and lays her husband’s clean underwear on his bed and tells him she will sleep in the guest room. Joon asks why she is behaving like that when he only said they should live like an ordinary married couple (hell, they aren’t even living like a “normal” married couple, that would be a step up for their relationship). Hye Sook says nothing and just continues out of the room. Joon follows after her and grabs her, saying he will sleep in the guest room since it’s cold from disuse. The annoyed Hye Sook turns around and the pillow knocks off a plant in a vase, shattering it by her feet. Joon immediately asks if she’s all right. So he has some feelings for his wife – just not the love she wants. He goes to look at her feet and Hye Sook says she is okay, but her husband insists on looking. He carefully tends her cut foot and Hye Sook says he can be cruel at times. Joon says that is his personality, so what can he do? He tells her to be careful not to get the cut wet and Hye Sook asks if he really is worried about her and Joon replies with how can she even ask that. You can see the war on Hye Sook’s face. She desperately wants to believe there is something there, but also can’t honestly believe it. Do Jin is up in his room watching Saewa’s first major broadcast. He notices Donghae and recognizes him from the food allergy. We then cut to Donghae who is still desperately trying to call Saewa. Bongi has enough and grabs his phone away. Donghae asks what she is doing and Bongi tells him that no matter how long he waits, Saewa will not come to him. Bongi tells him his actions won’t win Saewa back. If begging worked to save love, then no one would ever break up in this world. Harsh – yet true. Bongi then tells Donghae that he has no idea what Saewa’s situation is. Bongi then changes topics and asks if he has forgotten why he came to Korea. He has to win the gold medal at the World Cup and hang it around Saewa’s neck. Whatever he’s done to disappoint his (ex)girlfriend, he needs to start making up for it. Donghae needs to concentrate on winning now, right? When Donghae says nothing, Bongi finally brings up Anna being all alone and needing her son. The poor, shell-shocked Donghae finally moves towards the hotel. Bongi watches his back and then shoots an angry glare at the apartment building. Donghae goes back to the hotel where Anna asks if Saewa was happy. Donghae lies and says yes. Anna smiles happily and says she knew Saewa would be before going to bed. Donghae sits against the dresser and miserably recalls all of Saewa’s words. The next morning the Kims are all gathered for breakfast. Do Jin asks his mom if she remembers the speed skater who caused a ruckus. Do Jin asks if Donghae is still at the hotel. Hye Sook remembers and asks what about him. Do Jin replies that he thinks something is wrong with Donghae as he acted out in from of the cameras on this broadcast. This catches Joon’s attention who wonders how Do Jin managed to watch a show that aired so early. Do Jin then talks about how bad Donghae acted when his mom was hospitalized with the food allergy and then again when he was on the program. Do Jin then says he felt really bad for the announcer. This does not garner Joon’s sympathy as it is a common occurrence and announcers need to be able to deal with such things smoothly. Was that Do Jin’s plan to help? How pathetic. Bongi arrives at the hotel and finds Anna polishing Donghae’s helmet. Bongi asks where Donghae is and Anna replies that he left early as the match is tomorrow. Anna believes Donghae will win. Bongi asks if he was okay the other night and Anna says that he was since he proposed to Saewa. Meanwhile, Donghae is at the TV station. He finds the PD from the program and apologizes for what he did. The PD tells him to forget and goes to leave, but Donghae stops him and apologizes once more for letting his temper get the better of him. Donghae says he doesn’t want the PD to blame Saewa for what happened. At this time, Joon gets off the elevators and is walking by and overhears Donghae talking to the PD. Donghae tells the PD that Saewa did not lie – Donghae did promise to go on the show and then reneged (not true) and then when he went on the show, he got angered thinking about his mother’s past and just kind of erupted. Donghae apologizes and says he is willing to go back on TV once more to find his father if that is what they want. The PD erupts and says they’d be crazy to put him back in front of cameras. Donghae apologizes again and reiterates that it is not Saewa’s fault at all. He bows deeply and apologizes once more. Joon asks who the man is and is told that Donghae caused the TV accident. Saewa arrives at the office and is immediately asked what happened by a coworker. They all thought that Saewa was in for some big time discipline, but she is being let off lightly. Saewa smirks at this and recalls Do Jin’s words the night before about a genie who might be able to help her. HATE Saewa. Feeling is not going away. Saewa happily wonders if Do Jin told Joon about her already then. Speaking of Do Jin, he is in his mother’s office. Hye Sook is asking where he was as she did not here him come in the other night. Do Jin is about to say something when his phone rings. It’s Saewa. Of course. Do Jin says he was just talking about her – how did she know when to call? Hye Sook’s head comes up from her work at Do Jin’s tone. Saewa then tells him that a genie must have helped her as she is not getting exiled to some province. This surprises Do Jin, but makes him happy. Saewa then offers to buy him lunch to thank him. Do Jin agrees to meet her in the lobby. When he hangs up, Hye Sook asks when she can finally meet Saewa and find out if the girl is like Hye Sook like Do Jin said. Do Jin says he will talk to Saewa about meeting the parents when they have lunch. Hmm. Kang Jae is driving Sun Ok in a blue van. Sun Ok demands to know where they are going, but Kang Jae won’t tell. They finally arrive an Kang Jae helps her out of the van and takes her to a cabbage patch. 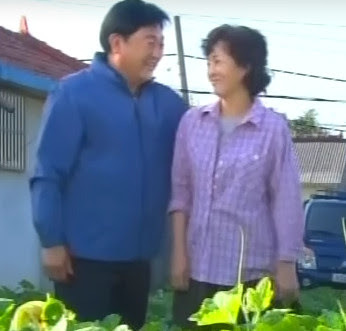 He asks his wife what she thinks and she says the obvious: “it’s a cabbage patch.” Kang Jae says the harvest will be good and he will make a lot of money this season. Sun Ok asks if that is what he wanted to say. Kang Jae laughs and says they should plant their dreams in that field and shout their worries away. Kang Jae then says that their children will leave them someday. He then tries to bat for Tae Hoon. Kang Jae promises to be a better husband and asks Sun Ok to let Tae Hoon go to Sae Young and the twins. Sun Ok starts melting and Kang Jae gets all mushy declaring his undying love. The tension is eased and Sun Ok’s mood has improved. Yay. But for how long, I wonder? Sae Young gets a call and learns that her mom did not show up for work. The worker says she tried the cell, but Sool Nyeo isn’t answering. Sae Young hangs up and goes into her mother’s room, wondering what is going on. She then notices a lipstick message on her mother’s mirror. Sool Nyeo calls her daughters bad and saying she’s leaving whether they care or not. Sae Young is is shocked and immediately wonders if Sool Nyeo has gone to kill herself. The poor girl is very upset at this thought. Sool Nyeo is visiting her husband’s grave. She pours out all of her current problems and how she must have messed up severely for Sae Young to get knocked up and Saewa to be so cruel. At this moment, Pil Jae arrives at his wife’s grave with flowers. He puts them by her grave and brings out a smiling picture of Songi who looks so much life her. His daughter is all he needs in this life. Back at the hotel, Saewa arrives and heads towards the lobby as Do Jin comes. Oh, and wouldn’t you know Donghae arrives, too and notices Saewa. He immediately rushes over to her. Saewa is shocked by this. Donghae grabs her wrist and says that they need to talk. Do Jin just came in from the opposite way so expect fireworks in the next episode. Wow! Saewa changed her heart just like change her clothes! That easily she dumped DongHae and moving on to Do Jin. I have a new name for her since she knew his identity. Gold Digger… I will now refer her as GD! I loathe Saewa and Do Jin for that matter too. Goes to show her 7 or so years with Donghae meant nothing if she could dump him so easily & keep doing all those bad things to him & Anna. I am getting there with you. Right now, I am hating her and I will loathe soon. She is very selfish and all she could think of is her personal career goal. She has no heart! Grrrrrr…. Ok, off to ep12!